I just can’t say enough about how much I love beautiful flowers and fabulous landscaping! I have created several Boards on my Pinterest page with flowers, gardens and outdoor spaces that I am in love with. Flowers and gardens give me a sense of relaxation. I stay really busy with my life as a Realtor, so coming home to flowers and a lush garden just make me feel warm and fuzzy inside…content. I wouldn’t go as far as to say beautiful gardens increase the value of your home, BUT, I would say it certainly makes a home look great and sell well. Think about what you look for in a home. A nice, well maintained yard, is most times on the list of “must haves”. Compare a home with absolutely no landscape to one that is lush, gorgeous and inviting. Which would you choose? I know which one I would choose! I know you are most likely thinking that gardens take a lot of water to maintain the lush look. Not so much. Flowers adapt nicely to your watering schedule. I choose flowers though, that do not take much water. 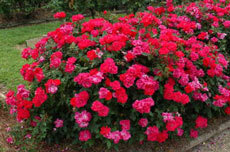 Roses are probably one of the best examples of low maintenance and low watering requirement. Think about the rose bushes you see in cemeteries. How much watering takes place in a cemetery? Virtually none! Many new home developments around the Austin area are requiring that the homeowner only have 50% of their yard in sod, the rest in draught tolerant plantings. The subdivision, Rancho Sienna, is one of those. ….By the way…. It appears that the City of Austin is looking into the processing of gray water for our use here in Austin. More on that in another blog post. All around Austin you will see Knock Out Rose bushes everywhere! That’s because they do not require much water; i.e. : draught tolerant. They give a huge burst of color into the landscape. More bang for the buck, so to speak. In fact, you may not know that many varieties of roses were created from grafting rose stems from rose bushes in cemeteries…thus the name antique roses. Now that I have given you something to think about in the landscape….. Which home would you choose? The yard with the beautiful landscaping or the one without? If you bought a home last year, then you have until April 30, to file for your Homestead Exemption! Chop Chop! Times a wasting! This is very important and not many new homeowners know to file for a homestead exemption. It is always discussed at the closing table but chances are, you were overwhelmed on closing day and inundated with info and paperwork, that you may have missed this tidbit. What is this thing you speak of, you ask? Well…….A homestead is the one primary residence of a person, and no other exemption can be claimed on any other property anywhere, even outside the boundaries of the jurisdiction where the exemption is claimed. Not to get too technical but a Homestead exemption is a legal regime designed to protect the value of the homes of residents from property taxes, creditors, law suits, and circumstances arising from the death of the homeowner spouse. Laws are found in state statutes or constitutional provisions which exist in many states in the United States. The homestead exemption in certain southern states has its legal origins in colonial Spanish exemption laws. Exemption laws in other states were enacted in response to the effects of economic depressions in the nineteenth century. So in Texas, a homestead exemption helps you save on taxes on your home. An exemption removes part of the value of your property from taxation and lowers your taxes. For example, if your home is valued at $100,000 and you qualify for a $20,000 exemption, you pay taxes on your home as if it was worth only $80,000. Nice huh? Below are the links to download the necessary forms to claim your exemption. Don’t delay, as the deadline for filing is April 30! You should receive your preliminary tax assessment in May or June. If you need help protesting your assessed value, please contact me for assistance in determining current market values. 10917 Panoramic Vw is northwest of Austin, Tx and only 7 miles from Cedar Park, Tx, on the North side of Lake Travis, high on a hill. Views View Views! It has 5 bedrooms and 3 full baths and sits on 3.2 acres. Work from your shop and enjoy the views! CALL ME FOR A SHOWING! Getting out of debt is the goal of many. At the top of the “get debt free” list for most people, is paying off the mortgage. Who wants to pay on a mortgage for 30 years? There are ways of paying off your mortgage early, outside of winning the lottery! Check out how it can be done! Mario Andretti was on hand Sunday for the debut of our new Formula One race track in Austin Texas. Andretti drove the first official laps during an opening ceremony on Sunday and was the ribbon cutter at the official ribbon cutting ceremony. Andretti was the last American driver to win the Formula One World Championship in 1978. He is so excited that Formula One has come to Texas! Many say that Formula One in Austin will be as large of an event as the Super Bowl. That’s hard to believe, however, Formula One has quite a following of over a half billion people worldwide! The race is sold out, but you can still find tickets for sale online. The tickets are pricey though, as some start at $300 and most go for thousands of dollars. Austin has also become a ‘McDreamy’ city! For those of you that are fans of Greys Anatomy, you will be excited to know that McDreamy made it to Austin and to Formula One! Just so you know, he won’t be just sitting around looking pretty or doing brain surgery. He races! Yep! You read that right! He did a test run of his car on Sunday as well. Patrick Dempsey is a sports car owner, road racer and sport team owner. He made comments that its a really good opportunity for F1 to come back to this country and start a new tradition. Many hotels, restaurants, and event centers are sold out on Formula One weekend in Austin, which is Nov. 16-18, 2012. I was recently dining at Perry’s Steakhouse and the General Manager told us that Perry’s is sold out the week of Formula One. This event is going to be great for Austin. It will generate millions of dollars for the community. Is Austin ready for Formula One? You bet we are! Bring it on! Formula One Comes to Austin! Austin, Texas has been known through the years for hosting some fabulous events that has attracted people from all over the world. Austin is already known as being the “Live Music Capitol of the World”. We get this by hosting the annual SXSW Interactive Festival in March throughout numerous venues in & around downtown Austin into the south Congress/south Lamar locations close to Travis Heights & Zilker Park. There is also ACL or Austin City Limits typically held in September in Zilker Park. People from all over the world come here to see the latest in technology, but also the most popular current music groups or individuals or soon to be famous group or individual. There are also numerous concerts throughout the year at different venues attracting crowds. There is now an even bigger event coming to Austin that will draw people here from once again around the world! From November 16th through the 18th, our fabulous city will be hosting an event that no other U.S. city will have. Formula One Racing comes to Austin! On the world stage, this event rivals the Super Bowl, World Series, & even The World Cup! That is saying a mouth full! 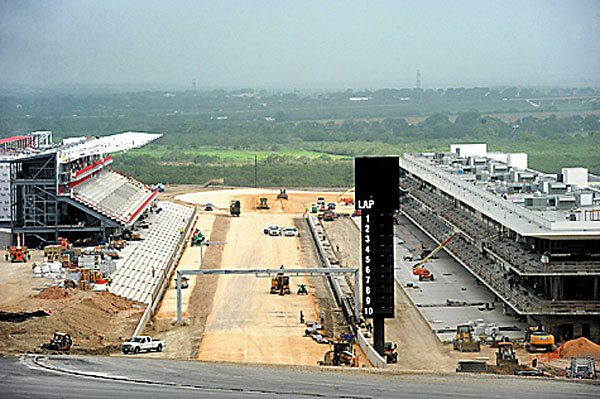 The racing venue is currently under construction located just south & east of the Austin Airport right off State Toll Road 130. Outside of the racing events, there will be numerous activities around the city. The majority will be held in the downtown Austin area. I hope you visitors from not only foreign countries, but also those that live anywhere in the U.S. will devote some time to see Austin and the surrounding hill country and see why I love calling it my home. You will enjoy the beautiful areas such as Barton Creek, Steiner Ranch, Lakeway, Tarrytown, Hyde Park, Bee Cave, & Arboretum just to name a few.